Feeling hopeful today, about something that felt entirely out of reach yesterday is always a good start. 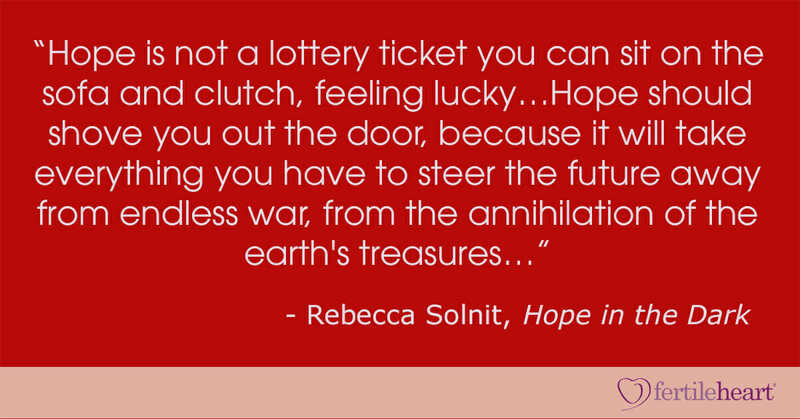 But I LOVE activist Rebecca Solnit in her brilliant book, Hope in the Dark, telling us that hope must translate into action if it’s to initiate any real change in our lives, or in our frighteningly dysfunctional human clan. Passive hope is a signature of the Orphan, lulled into waiting, sometimes waiting for years, for someone else to act on her behalf. For someone else to choose for her. Active hope lifts us out of our chairs, and yes, “shoves us out the door.” Active hope calls for a jailbreak from a self-imposed incarceration. The jail that’s locked from the inside. It doesn’t come with guarantees of things turning out exactly as planned. But it does come with a guarantee of movement; a guarantee of another unfolding, of growing clearer about what it is we really want and what are we willing to offer in exchange. That’s what’s been so lifesaving for me about my own diagnosis: After years of passive hope, I finally stopped waiting. That’s also what’s been so thrilling for me to witness: seeing people leap into a brand new way of thinking about their wish to birth a family. Seeing clients who are scientists: biologists, physicians who have been trained in a reductive, linear, cause and effect way of approaching symptoms, suddenly—through experience, rather than textbook doctrines—embracing an entirely new way of approaching their diagnoses. Are you waiting? For someone? Something? Have you hit the road yet? What would being “shoved out the door” look like for you? I hope everyone is having a good December. I have been working with Rock the Baby Fertile Heart body truth and 9 Hearts Fertile Heart Imagery. I have been having challenges the last few days because of difficult interactions with my new daughter-in-law. I am working on (and my husband with me) not allowing her to “drive our boats”. In other words we are trying to work out ways to not let her reality dominate ours. I’m starting to feel, after 3 days , a little more hopeful. I’m also trying to figure out how I would comfort my daughter if she were having similar challenges with another individual. My anger orphans have really been working overtime. I’m trying to get back to taking care of me in the most conception-friendly way possible. I hope you all are having an easier time than me! I have been working with the visualization of the orphan at the feast table imagery and with Rock the Baby Fertile Heart body truth. My son will be moving out of state soon so my orphan at the table was feeling lonely and unloved. In the imagery I have many people who are wonderful in my life bringing me nourishing and delicious food for my feast table. It makes me appreciate those I have in my life. I am also working with telling myself that every visionary step I take is making a difference. I seem to find it easier to follow through on commitments to others than commitments to myself, so I am looking a t that. Why do I do that? Congratulations on your baby BlueFlower. Sweetness, wonderful for taking care of yourself and jorjen wonderful for the perspective of a better experience. Thank you so much for the Golden Shield imagery, Julia. I thought I would be needing to use it yesterday, but was pleasantly surprised not to have to. It is a wonderful imagery to have handy. I continue to work with the White Flower imagery and Rock the Baby Fertile Heart body truth. I spent a large portion of the day concerned about my daughter’s choices. I am working on doing my best and then letting go. I find that work is a part of my thought process way more than I would like. On my way home from work I am working on switching gears to focus more on me and other things in my life. Happy Thanksgiving and blessings to all! Thank you for this beautiful post, Julia. You are, as always, so right: hope simply must be translated into action, as otherwise it will (in most cases) get us nowhere. It upsets me how much stuff I’ve read out there in the ‘New Age World’ about how JUST visualising or desiring something will manifest it. Yes, visualisation (as those of us here know through the beautiful & potent imagery you offer us) is a powerful tool, but I believe in most cases it has to be accompanied by taking actual action in the ‘real world’ too. And taking action is risky, scary. Because you might not get what you want; you might make huge efforts and not be rewarded with the ‘prize’. I felt like this when we decided to try out one round of egg donation, as really our final step in our journey to bring us a child. We could have gone through the emotional and financial investment of this big step and come away empty-handed. But I knew that however much this scared me, it was a better choice than not taking the risk. At least, had it not worked, I would have known we’d walked to the very end of our personal road on this quest. As it happens, it did work. I also know that had we not taken this step, a child would have been out of our reach (that’s obviously not the case for everyone, but with a combination of my the-wrong-side-of-45 eggs plus male factor issues, I’m certain conception would not have happened). I often wonder how I would be feeling now had the cycle failed and I’d had to put my desire for a family aside. I’d like to think that walking this path to my own personal finishing point would have regardless helped to shift me to a different place. Thank you for the post. I feel like I have been actively wanting this baby but at the same time passive. This is because I want someone to tell me what is wrong with me. Why can’t I get pregnant? I’m eating healthy, I take care of myself. I have low egg reserve and have been trying for over a year. I’ve seen numerous doctors trying to figure out what I can do to make this happen but they tell me my age and low reserve will stop me. When I came across your approach it became eye opening. I’m the one that could be stopping me. I’m getting in the way of it because I’m not listening to my Orphan. I have been working on imaginary for weeks and dream journaling. I am taking more time to take care of myself. Trying to listen to my body when it tells me to keep going or back down. I need to listen to what my body is telling me what is right for me, not let other people tell me. I really understand this more after reading Inconceivable. What an energizing post! I now understand all the ways that hope, paired with waiting, have been a part of this journey for me. I waited for what I thought was the perfect time to conceive my child. I hoped each month that my desire for a child would become reality. I also spent so much time hoping that the action steps I took were the right ones, and I would wait for confirmation from an outside source. My actions became weakened when they were not rooted in my truth and instead were doomed to fail with the orphans in charge. This post has me reflecting on my previously held belief that perfect plans, coupled with determined efforts, and linear and logical steps was my path to the baby I hope for. Now, I am on a path where I do not know the way, and I do not know if I will get exactly what it is that I think I want. A large part of me believes that what I will experience will actually be much better than I could have ever hoped for! WithGratitude, I like “I’m going to be a mom anyway” and your visionary strengthening during delays in your treatment. Chopin, how wonderful your husband is healed! I have been working with Rock the Baby Fertile Hear Body Truth and White Flower Fertile Heart imagery. Currently I would like to strengthen my visionary who makes the best choices with how I spend my time, the thoughts that I have and the choices I make. Another thought provoking post Julia, thank you. First of all congratulations to you both Coconuts and eaglemama! It’s amazing that you can continue to use the OVUM practice in all phases of your journey to address what you need. Keep up the great work! As for active hope, I’ve had an interesting shift in recent days. I’m on my 2nd delay for my upcoming FET that I expected to happen a couple of weeks ago. I got sidelined for a couple of medical reasons that need clearance before moving forward. And in this time I have been able to spend time with my orphan who’s been scared and angry. However, I realized this week that I have been thinking of the most recent delay differently. Yes, I’m frustrated and the delays are completely messing with the timeline I had created in my head. But in trying not to let it get the best of me, I started thinking (rather confidently) – it’s okay, I’m going to be a mom anyway, so one or two months more doesn’t matter. I’m not entirely clear how this visionary blossomed, but maybe the work I’ve been doing with my orphan over the past few months has helped birth her. This small shift in my thinking feels a bit to me like active hope. I think being “shoved out the door” for me would feel like a freedom from the burden of worrying, second guessing, wondering if I’m “doing it right.” Hoping in a way that’s clear, defined and free. I think it would feel like my thoughts are coming from the V and not the O. Thank you for your blog post – I had to read it a few times until I finally understood what you meant. I know now that I have that part in me which doesn’t want to understand as understanding means action….! I have been waiting to be free and have faith in myself… I keep thinking someone else will have faith in me and then it will all be ok, someone else will set me free. But I am slowly meeting myself and realising that faith has to come from inside me, can’t be given to me by anyone, and that only I can set myself free. I am now on my path to freeing myself from (and living with) my fears, turning my fears into action to soothe my fearful orphan, and to have faith in myself , to trust myself that I know what is best for me. And most of all, to build a life where I feel safe and keep the faith that I will birth a new me and perhaps also another baby. So, my active hope has meant facing my fears – it’s still hard to do so, but I know that it is ok to open my heart to my fears as I have a Visionary self who will help me soothe my fears with action that makes me feel safer. This sounds a bit theoretical.. so, in practice, for example, last week I was feeling so lonely. There was a chance to go to a major demonstration with friends or go to yoga… not going to yoga is a big thing for me as I LOVE yoga. But my Visionary and UM reminded me that I feel lonely so I decided to meet up with my friends and march together… it felt great to do that, not just to catch up with my friends but to reinforce my views with action! This week, I have been doing “Lifting the Burden” and it gives me such a sense of lightness. I haven’t done as many body truths – so that is my next step. Getting back into doing my BTs regularly, because I want to.. not forcing myself to do this as “someone said it’s good to them”, but doing it because I want to do it. I would like to share that the hopeful visionary is a tough friend in my mind, she shows up uninvited as when friends tell me about their aunt who had their kids at 42 and 44, after twelve years hiatus since their first two kids. I love hearing stories like this, they feed my starving orphan who has to always feel undernourished, for some reason. Starved for my culture, living in my husband’s culture, feeling forgotten when my sister in law has two kids and she didn’t need to try at all. Jealous at my brother for not getting sick the way my husband did, etc etc. But the truth is, that when my husband after chemotherapy had no sperm, I said on Julia’s circle, I knew his sperm would come back – and it did – something the oncologist did not even believed in. Over the years since his recovery, four and a half years, he is healthiest I ever knew him. And even I am less skinny than before, I am less traumatized by the experience of seeing him suffer. What would happen if we had a child? We would be over the moon, can we take so much joy? Sometimes I visualize the little boy standing in our kitchen and a part of me knows, that he will appear one day if only I let go of the sadness. Thank you, Julia, and all the women on the calls for listening to me over the years, you have been a grand help! Dear Coconuts and Eaglemama, Congratulations to both of you and may those fearful orphans become beautiful visionaries. Keep using those courageous voices for they are guiding to not only you but to all of us. Dearest Julia, thank you for yet another beautiful posting. Fear has been one of my strongest and long lasting orphans. I realize now that another very well could be passive hope. 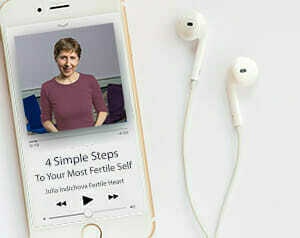 My fertile heart practice has changed so much for me over the last five years. It has helped me find my voice and who I am. It has helped me become the mom, wife, daughter, friend I am today. And yet, my orphans continue to need more love and parenting than ever before. “What would being shoved out the door look like for you?” For me it would be about trust. About knowing that even if I can’t see what lies ahead or where my feet may land, trusting that I will land in a safe place on solid ground. For me, it means knowing that if I open my eyes in complete darkness I may see more than I see now. Being shoved out the door may just be what I need right now as I struggle to decide what road to take. Because if nothing else, just walking forward puts me on the road, even if I don’t know for sure yet where I may be going. Congratulations coconuts and eaglemama on your pregnancies. I hope all goes well. It sounds like you both are doing wonderful work, and particularly working with fear orphans in a healthy way. I have been working with Rock the Baby body truth and 9 Hearts Fertile heart Imagery. I’ve been working to take care of myself amidst the business of working full time. I’m still working that out. I believe being shoved out the door for me would look lie not over-thinking everything and trusting more. I was really moved by the honesty and openness and of the women who wrote after your last blog post. Moved by their courage to share, by their ability to connect thoughts and feelings and their use of the OVUM tools to make sense of their lives. It made me realise that ‘being shoved out the door’, for me, would be to speak honestly about my situation. To do so terrifies my orphans who think it’s not safe, that I’ll be ridiculed for my failures and attacked for my joy. To be really pushed out the door I’d need to use my real name, to identify myself, but I think that’s a step too far for me today! But I can say that after my third miscarriage in August, I read your books, started the imagery work and joined the intro teleconference. I find your work powerful, like it started a subtle revolution inside of me. I don’t look any different on the outside, but I’ve experienced big internal shifts. I realised that my desire for connection and belonging was at the heart of my longing for a child but that it’s inhibited by my social phobia. So I joined a therapy group which is challenging but very rewarding. I realised that I wasn’t listening to my body – I had a lot of digestive problems but was only listening to ‘experts’. Talking to Julia in a teleconference and doing the OVUM practice helped me to trust myself and I stopped taking most of my supplements, stopped acupuncture and gave my body a break. I also started fertility yoga. I did some drama therapy which helped process the trauma I carried from the birth of my daughter who’s now three. An orphan keeps jumping up and down screaming at me to stop writing this, telling me it’s not safe and that I’m taking up too much space, being gratuitous and selfish, showing off. To be seen and heard wasn’t safe for her but it is safe for me now. There is always a risk, but I believe I am resilient enough to take the knocks now. My longing for another child helped me navigate and grow from the grief of three miscarriages. The past month I decided to take a break from actively trying to conceive and to prioritise my health. And now I’m pregnant! It was a big surprise and I’m thrilled but I also have some orphans simmering away, afraid that I’ll have another miscarriage. I’m doing Nine Hearts and Blanket of Reassurance to soothe them! But the timing of my pregnancy means I will have to miss an appointment with a recurrent miscarriage team that I’ve waited three months for – they won’t see pregnant women because they can’t do the required tests. So I don’t know if there’s an underlying reason for my miscarriages. And I was sick in the days leading up to my positive pregnancy test with a virus and low temperature and fear that that may have harmed my baby. So my orphans still run amok but in writing this I feel more connected to Julia and the Visionary Moms phone circle which calms me, and I’m closer to putting myself out there in a real way. Coconuts, congratulations on your pregnancy!! !Julia’s teleconference was a turning point for me too, I’m in my 33 week after four miscarriages and also a scary birth of my daughter. Talking to Julia on the calls was the first time I realized that my daughter’s birth was not as uneventful as I thought. It took me a while to do the body truth exercises with the imagery more regularly, but once I started doing them, I also could feel a real shift. I also did Nine Hearts and Field of Creation and Three Steps Forward and I recently added Busy Being Born. I love that one, it’s helping me deal with the orphan that’s still a little scared of another tough birth. Keep the faith, coconuts, sounds like you’re on your way. We’re all on our way as Julia says, to meet our children halfway, so we just have to keep the faith until we get there. This community is a godsent, helped me keep the faith when I really didn’t know where else to turn. I’ll be eternally grateful for that!!! Thank you for your post Eaglemama and congratulations on your pregnancy! To hear that you’re 33 weeks after 4 miscarriages is incredibly inspiring. And thank you for sharing what imagery is working for you – I’d never done Three Steps Forward and did it straight after reading your message and it really speaks to me right now! This is a truly awesome community! I have a sincere request – Once you both are comfortable, can you please write an elaborate account of your journey leading to motherhood in the forum thread “Triumph over despair”? One of our mamas created it and we all worked diligently to pull all the stories buried within fertileheart forums and posted out there as it gave us enormous strength to know that other mamas journey and seeing light at the end of the tunnel while diligently working on our orphans and enjoying our scenic route to motherhood. BIG THANKS to you both in advance. Dear Coconuts, congratulations on your pregnancy! I enjoyed reading how you decided to take a break from trying to get pregnant and that’s when you got pregnant..I am seeing that this attitude of not being watched to closely is good for me too. I don’t like being under the microscope! I can hear your orphan who is yelling that you are taking so much space, this one sounds too familiar to me. As though it is bad to take up space? That’s what makes us human, to take up space and move in it. Again, congrats, and hopefully, if I may, I have a dream that I will soon share the news of our pregnancy, in not too far future, totally unexpected and yet always already anticipated.